As we look to 2010 it is with great hope and excitement! We have 10 goals for year "10"
1. Finish the first stage of the building in Chan Chen and open the hotel worker's training center to volunteers by Dec.
2. 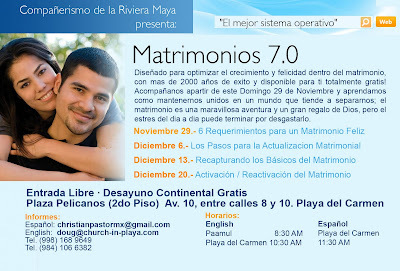 Find a location for our church in Playa that we can use seven days a week as needed. 3. Grow the leadership team on the Spanish side of the church in Playa. 8. Continue to grow the Fellowship of the Riviera Maya Church in numbers and in faith. 9. Send out mission teams from our church in Playa to serve in Chan Chen, U.S. and Cuba. 10. Continue to build our online prayers support team... We are looking for 2010 more prayer partners in 2010.. Please pray for our services tomorrow in Paamul and in Playa. Monday morning we are going to be flying to Myrtle Beach SC to speak at Ocean View Baptist Church.. We do need your prayers. This Sunday we are restarting our 8:30am service in Paamul. We meet in Playa at 10:15 and in Spanish at 11:30 this will be a full morning. We need your prayers. These three guys along with me make up our leadership team in Playa. (Left) Daniel Peñalver is our praise and worship leaders and also serves a pastor to our growing Cuba Community. (right) Luis Garcia - we call him our pastor of facebook, he is our connection pastor making sure people are connecting with our church. And I (Doug) need your prayer as well as I lead this team to build a great church. We are seeing a lot of new people coming to our Sunday Worship services each week. This is pretty amazing because we don't have the money to spend on promotion. The only adverting we are doing is word of mouth. 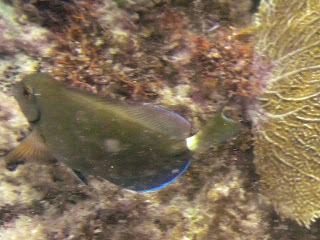 If you are in Playa you are going to need to check it out. God is Woring in Playa. Pray for our Paamul service as well we are going to try to restart Nov. 1. We are going to start this weekend a new 5 week study, I am calling "from the Heart of Fellowship Church." We are going to anwser the question why is Fellowship here and what are we hoping to see happen. We start tomorrow by talking about what does it look like to be a mature follower of Jesus Christ in Playa Del Carmen Mexico in 2009. Pray that God would feel our building tomorrow with people are really to hear from the heart of God. What does it look like anyway? Most of the time we operate with a flawed understanding of what it looks like to be spiritually mature. This faulty definition has caused many churches to actually get in the way of those interested in a relationship with God. So what does it look like to spiritually mature? And how do you get there? In this session we'll discuss how you can partner with Fellowship church to move in the right direction and bring others along with you. When you think about spiritual maturity, what comes to mind? Read Matthew 22:37-39. As you read through the accounts of Jesus' life you can't escape this simple but often overlooked question, Why would Jesus spend so much time with people who were clearly not God-fearing to the neglect of those who considered themselves more religious? As we explore Luke 15 to find the answer to this question, we'll uncover the driving force behind our church's past, present and future direction. Oct. 11 – The Most Important Question. Who is Jesus? Those who resist Christianity often do so because they have many unanswered questions. But when considering Christianity there is one question that trumps all the others. It doesn't answer the others, but it does put them into perspective. In this session we'll discuss how an influential man was transformed by this very question. Acts 9:1-22. Oct. 18 You really can change. People love to make predictions about the future—but all too often, those predictions are wrong! Why base our lives on predictions when God has promised us that we can really change? In Matthew 13, we find Jesus speaking to the crowds in a parable, as he often did. The people in the crowd were there for a variety of reasons—some to see what the fuss was about, others to see a show, and still others to listen—and to hear what the Master would say. Through this parable about seeds and soil, Jesus was really talking about all of us. And what he wants us to know is that personal growth is not only possible, it is expected. It’s something God wants to produce in our lives. Personal growth comes to those who have learned to listen. In this lesson, we’ll explore the three things that stop us from listening and three things that invite us to listen, as we look at Jesus’ explanation of this parable from Mark 4. Oct 25 - Our mission in the world. We will look the mission God had given Fellowship Church and who we plan to carry out that mission. God did not create us just to live for yourself. He wants you to care about the hurting people in your life. He wants you to make a difference with your life. He put you on this planet to make a contribution. You were planned for God’s pleasure. You were formed for God’s family. You were created to be like Christ. You were shaped to serve God. And you were made for a mission. Last Monday on my way back from checking on our work in village of Chan Chan I did something I rarely do and would not recommend as a way of church out reach, I picked up a group of men who were hitchhiking. The good news is they did not kill me and all seven of them came to church this morning that is a God thing. Pray for these men and their families I am going to meet with them and their families tomorrow morning out in the village of Antonio on my way to Chan Chen. Had a great time with the youth tonight in Playa. Celebrating freedom, playing Wii, eating pizza and praying together. I was out in Chan Chen today.... The project is going well the money is coming in slow so the work is slow but somehow we are keeping the project going and that is a praise the Lord. On the way back home today I picked up two hitch hikers I was able to talk to them about the Lord and about our church in Playa. They say they are going to be at church Sunday. Many people in our area seem to be really looking for help but not just a handout, real help. It is a different season here in Playa, people have always been superficially open but now many are really seeking help. Pray for our church in Playa and our work in the Mayan Zone. So few English speakers are here at this time of year so we are not planing to start meeting again in Paamul until Nov. 1st. We are changing the meeting for the English speaking worship services and I have not had the time and or the money to get the word out. We are going to be meeting Paamul at 8:30am and in Playa at 10:15am. Pray that God would being people to each of these worship services. We are also doing a food drive. This is the heart of low season here and many families are hurting... Pray that our church will help meet the needs of the hungry..
We had a great day today playing with the kids in Chan Chen. We have now built many friendships in this small Mayan village about 2 hours east of Playa Del Carmen. Today we saw about 400 children come to a kids program.... It was a little crazy at times but in the end the kids understood that we love them and the God also loves them. I am learning a lot about Canadian geography this week. Today our first mission team from Canada arrived. We are exicited about the week to come. Pray for this team as we are going to be working out in the Mayan Village of Chan Chen. We are getting ready for a youth mission team from Canada who will be coming in this weekend. We are going to be working out the Mayan Zone. Pray for this team... and our weekend services. We had a great time in all three services Sunday. We preach on the " You are light of the World" We handed out small flashlight to everyone and did a modern day candlelight service. It was a lot of fun and I am sure we will remember this one. We are expecting to have about 30 adults at a meeting tonight to talk and make plans to reach our community for Christ. Many of these people are new believers we are excited about what God is going to do this Fall. We need your prayers and your financial support as we go forward. We are back at it and it is HOT HOT HOT,,,We need your prayers today. I am going out to the Mayan village of Chan Chen this morning with Pastor Mark Goodman from Alaska... He and his wife are here on a family mission trip.We are looking forward to our Weekend Celebration as the church comes together. We are in North Carolina this week. Darla and I are visiting with my folks in Greenville NC this week. Great Weather 78 degree high in July! After five weeks of volunteer mission teams we are taking a short vacation in the States. Next Monday will be Darla's birthday so we plan to be with her Mom in Puxico Mo. Our son Brandon is going to be coming over from Dallas so this is going to be a good time with family. Today we when to pickup our FM2 visa. Living in Mexico for 13 years now this has just become part of our life, it's what we do every July. We have tickets to go to the States on Tuesday and the imagination office said that our papers would be ready today. We need this visa to leave the country. We went in first thing this morning and the office did not have electricity.. NO POWER NO VISA. Well we need you prayers that Monday we can get the needed papers to leave the country. The Alaska youth are leaving today and we have a very busy weekend coming up. We are planing on going to visit our family in the States on the 14th of July. We are getting our Mexican visas renewed this week so pray it all comes through on time for us to make the trip. Debbie Hill is home now at their house in Playa. She is going to have a few months of rehabilitation with the knee but she seems to be in great spirits. Start praying now for a movement of God in Playa. Starting August 16th we are going to launch a city wide campaign "OPCs PARA CRISTO" Christ has called us to be fishers of Men. OPC is a timeshare term that means "outside personal contact".... We are praying that we will enlist at least 25 OPCs to work for our church leading people to Christ. God hears your prayers so please pray. Pray also for the group we have here they are going on the camp out in Chan Chen for the next three days. The youth group from OVBC along with our local youth cleaning the beaches. The construction continues on the hotel mission training center in Chan Chen. We are building a eight room hotel to house mission teams and train the locals to work with tourist. Another trip out to small village of Chan Chen and another one planed for Friday. You might ask why do we keep on going and giving? I'm not trying to sound "Spiritual" but we are commanded to Go.... Second we love the people of Chan Chen and we want them to know and experience the love of Christ. OVBC donated over $1000 in new books to the school in Chan Chen. Please pray for all this activities knowing that God is at work. Brokenness is what I need"
That will bless Your heart"
You would not believe all the things that stop working this Sunday. I had worked all night Sat. reformatting the hard drive on my computer it was working great Sunday Morning and then for some unknown reason it would not work at all for the church services Sunday. Then the Sound System died at Paamul. So we had Fellowship Church unplugged in Paamul Sunday night. I had lost my sermon notes in the computer crash but for the most part I remembered my sermon. I also broke my glasses can you believe it. All was broken, no computer, no sound system, no sight, And my heart was also broken Sunday as I discovered that a good friend had really made some poor choices that is going to hurt many people. But in the middle of all this we still saw God at work. After the service we checked out the sound system and the computer and it all worked great. Coleman and his team of youth have been a great encouragement. They are getting to see missions life up close and we are learning once again life is not about stuff. We have had a busy week. We are seeing God continue to change lives. Last night at one of the small groups one young lady found new life is Christ as his open her heart to HIM.. He had a 20 of us make our way out to the small village of Chan Chen today. I had my weekly bible study with Rodolfo in his home in Chan Chen. 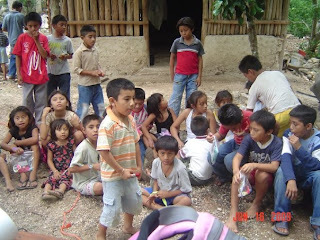 We also saw God at work as about 50 kids came out to the mission VBS and Rodolfo lead a prayer in Mayan for the kids . It was one of the first times he had prayed in public..
Monday started with the power going out in our house we have learned that we are going to need to have our house rewired about a $3000 job... Yesterday to had our staff meeting and our small group leaders meeting in our hot house. That was only the start to a real bad Monday. Darla took our dog Maya to the vet to have her spaded, we watch to much Bob Barker growing up. Anyway the dog died in the vet's office, we could not believe it. As if that was not enough bad stuff for one day my new computer crashed and I have lost all my email stuff onces again. I preached a sermon about Roman 8:28 this past week... Pray for us as we put our Hope in the Lord. We have two mission teams here this weekend. Sunday we have so much going on and we do need your prayers. 9:30 English service in Playa, 11:00 til 12:30 Spanish service in Playa, 1:00 kid's party in Paamul, English 101 class at Terry's house in Playa, 5:30pm Worship in Paamul and 7:30 youth worship in Spanish... Busy Busy Busy. We have a youth missions team coming in from South Carolina today. This group is going to be here for three weeks. The plan is to launch a student ministry in our church. We have a couple from Corpus Christi Texas, Alan and Rosie Schmitgen, who are also here for about four weeks. We need your prayers as we reach out to the youth of this area. I met tonight with four student that are very exisited about what God is going to do in the lives of students in Playa Del Carmen. We hope to have our first student lead worship Sunday night the 14th this week be a new weekly service in Paamul. Pray for this new beginning. We had about 40 first time visitors this morning..... Thank to the Lord and the hard work of passing out 9000 fliers this week. The mission team from Alabama was not here to see the results of their hard work but we felt their prayers. This week we have handed out about 9000 invitations to our church services in Playa. I personally talked to hundreds of people this week and when I talked about hope for the future you could see in the eyes of each person this was their hearts desire. Most people moved to Playa looking for a better life now with all the stuff that has happened, most have lost hope. Please pray for a movement of God in Playa.